A listing of all photographs available pertaining to the SOUTHERN PACIFIC. A section on Dunsmuir historical photos are also located here. There is also a section devoted to NORTHWESTERN PACIFIC operations in the 1960's. Photos of Union Pacific operations in the Dunsmuir area since the merger with the Southern Pacific. Union Pacific Special trains including the Challenger and various Directors Specials powered by the Centennial Unit and E-Units are shown. Photos of various Union Pacific Heritage Units are also show here. 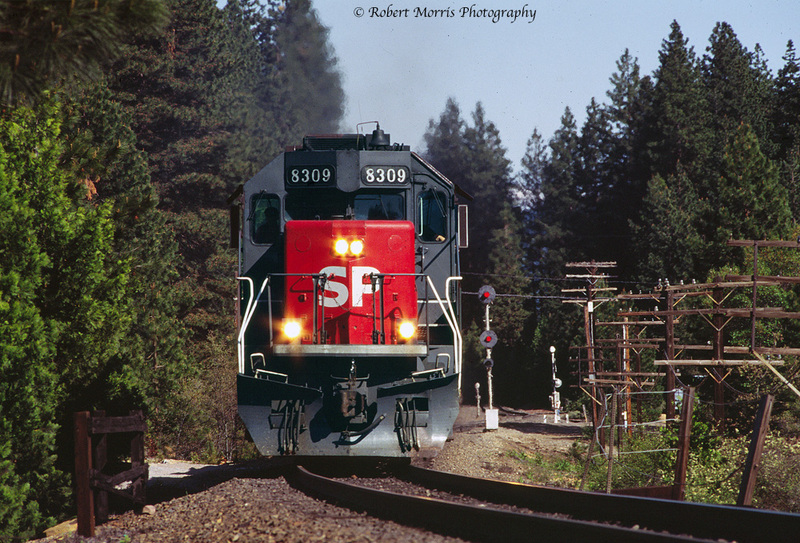 A listing of photos I have taken since 1960 of some of the following railroads including WESTERN PACIFIC, SANTA FE, CANADIAN NATIONAL, CANADIAN PACFIC, BN, BNSF & AMTRAK. Photographs of various shortline operations I have taken since 1960. Dunsmuir area railroads MCCLOUD, YREKA WESTERN and MODOC NORTHERN are shown here. I have also included the CORP line in this section. The SACRAMENTO NORTHERN, MODESTO EMPIRE TRACTION, OROVILLE DAM CONSTRUCTION RR, SIERRA RAILROAD and others that I photographed in the early 60's are also located in this section. Photos of railroad equipment on display during various Dunsmuir Railroad Days. Historical railroad and other photos of Dunsmuir and the surrounding area. Photos of special trains that have came through Dunsmuir over the years including the "Dunsmuir Shasta Daylight","Northern California Explorer", "Byways of California & Oregon" and the American Orient Express". Photos of Canadian powered trains passing through the Dunsmuir area. A listing of negatives donated to various RR Historical Societys from which photographs will be made available for purchase. Currently this section shows photos I took while in Bolivia doing photo assignments for the Department of Army Special Photographic Operations (Panama) in the mid-60's. More photos from other locations will be added shortly. This section will contain photos I took in the early 60's in San Francisco. This was a time period of much construction and destruction in the city. Much of the citys skyline changed radically during this time period as the photos will show. This section shows the destruction of San Franciscos landmark theater the "FOX" plus photos of cable cars and a few photos of San Francisco's Fire Department. More sections will be added shortly. Order directly by phone, send an e-mail, or use the printable mail in order form. International orders are accepted. Contact us by e-mail for shipping charges on international orders. You may now pay for your order using your PayPal account. Simply E-Mail us the photo catalog number and size of print and I will send you the total billing for your order along with the information needed to make a payment to my PayPal account. You may also use a check or money order to pay for your order. Postage and Handling of domestic orders is $5.00 per Order. One or more orders can be combined for a single $5.00 shipping charge. California residents please add 7.5% Sales Tax. All 8x10 and 11x14 Black & White and Color photos are printed on Inkpress Glossy Paper. Prints are made from high resolution files from negatives and transparencies using a Canon Pro 9000 with Chromalife 100 inks for long life. 11X14 prints are protected by a plastic sleeve with a cardboard backing.